Having a baby is undoubtedly one of the most exciting times in a woman's life. In just nine months, a tiny embryo will become a newborn infant with a smile that melts your heart. Whether this is your first pregnancy or you're currently the mother of several children, your child's birth story is guaranteed to be unforgettable. However, you don't have to spend your entire pregnancy wearing clothes that make you feel frumpy and unattractive! While it may seem like you're destined to be pregnant forever, your baby will be here before you know it. In the meantime, invest in stylish and attractive maternity clothes to showcase your beautiful pregnant silhouette. For example, you can accentuate your curves in a close-fitting maternity t-shirt. Even something as simple as a lace-covered maternity bra can do wonders for your self-esteem. Today's maternity fashions are more stylish than ever before. Whether you need a maternity coat or maternity jeans, you're guaranteed to find a large selection of casual, trendy, classic, and sophisticated styles. Even if you're looking for plus size maternity clothes, you can still find clothing to help you look and feel your very best. 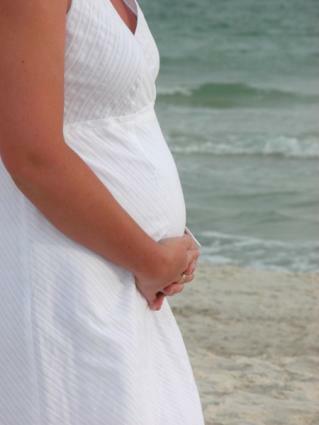 If you're on a tight budget, building a maternity wardrobe can seem like an overwhelming task. However, mothers are a surprisingly resourceful bunch! With time, patience, and skillful shopping, you can find a wide selection of cheap maternity clothes that fit your needs. Low-cost maternity clothes are available at discount retailers and consignment stores. In some cases, you may even be able to purchase wholesale maternity apparel.